As he sits in a room filled with Marathon rally attendees merrymaking, he quietly listens and watches — it’s obvious this unassuming man has no need to be the center of attention. Without an invitation into his inner circle or an insider tip from his self-proclaimed better half, Sandy Kincaid, one would never know that Shelly Ward is a stunt coordinator, racer, inventor, designer and wildly successful businessman, much less that he’s been involved in such well-known films as, “Mission: Impossible – Ghost Protocol,” two of the “Transformers,” “Rush Hour 3” and “Mr. & Mrs. Smith,” not to mention Super Bowl commercials and other projects most of the U.S. population has seen at one time or another. 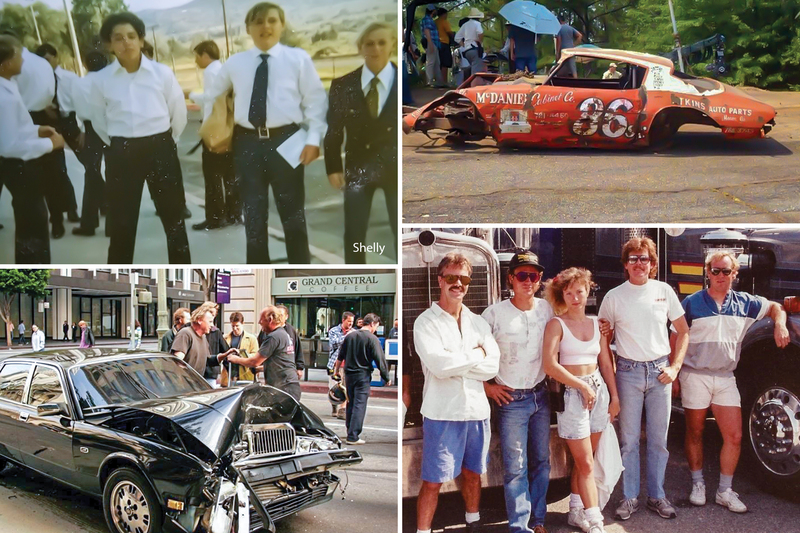 Shelly’s fascination with performance and speed is nothing new; in fact, he believes it began as early as his tricycle days, growing up in a car world with his father’s business of television commercial production. At the age of 16, Shelly earned the distinction of being the youngest driver to complete the Baja 1000 solo, an arduous, off-road, point-to-point competition that starts in Ensenada, California, and finishes in La Paz, Mexico. And that love for racing continued. “I didn’t go to my high school graduation in 1975,” said Shelly, “I was too busy racing the Baja 500. In 1979, he established Shelly Ward Enterprises, a vehicle prop fabrication and mechanical FX one-stop shop. Shelly can prep, paint and drive, having performed in more than 25 feature films and 1,000 commercials. If there was a diesel truck and a spectacular fiery crash involved, most likely Shelly was in the driver’s seat showing what he’s made of. Of course, Shelly is no one trick pony. He’s known in the industry for his ability to modify vehicles to do whatever the client requires. Although the two attended the same high school, even graduating the same year, it wasn’t until they met through the Screen Actors Guild that the Hollywood magic happened. Sandy worked in the commercials department and became the head of the stunt and safety committee and an all-around advocate for the stunt community. The two worked together from early in her career, but they didn’t know each other well, except for business purposes, until nine years ago. “I happened to run into him at a local restaurant in Agua Dulce and we started talking that one day — we’ve been together pretty much every day since then,” explained Sandy. Where Shelly’s into horsepower, Sandy’s into horses. 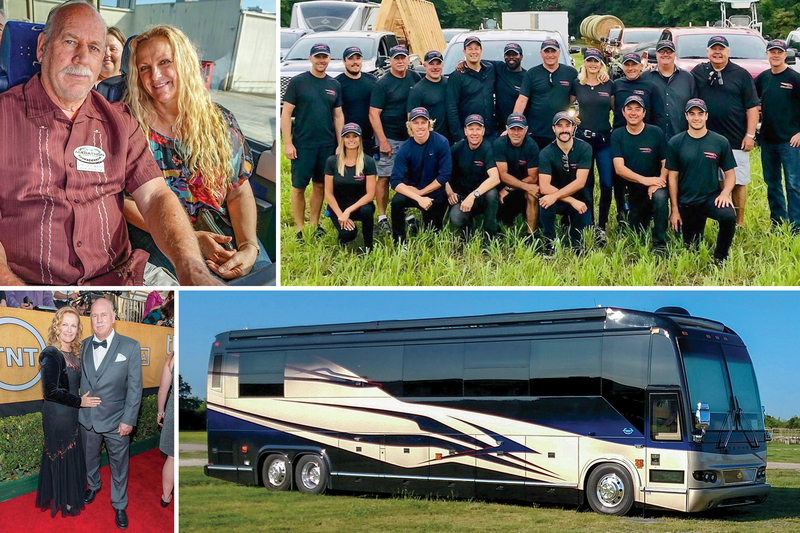 And where Shelly has owned buses since he was 20, Sandy has not. Although Shelly and Sandy enjoy adventures on their own, the two shared that everyone they’re really close to, they met at rallies. Well matched, Shelly also likes to go fast. When asked how fast he’s comfortable driving, his reply was instant: “As hard as it’ll run.” Having had quite the collection of fast cars in his day, he says he has switched his everyday vehicles because he still tends to push them as fast as they’ll go.